This thread on another forum drives home the fact that we need to be careful. My house had a severe fire on Sunday that started in the garage. My 2-story house is totalled and the roof structure must be replaced and the entire interior gutted. Fortunately, everyone is safe and we have realized that our material possessions can be replaced. This week has been a nightmare. Per the CSI-type guy who investigated, the cause was an electrical fire related to my 12V automotive charger being used to charge a Peg Peregeo 4-wheeler. It was not the house wiring or a fault in the outlet. My thinking is that my charger must have flaked out or the battery exploded. It is unclear if it will be narrowed down beyond that. I walked from the garage to the side of the house for a few minutes, heard a popping noise out in front, came around the corner, and saw massive flames shooting out of my garage in the corner where I had 6 vehicles stored. 3 more were elsewhere in the garage. The flames jumped up above the 2nd story and cooked the entire attic and most of the 2nd story roof caved in. Items that are not burned or wet are smoke-damaged and have to be professionally cleaned or scrapped. Fortunately, we should have enough insurance to cover most of our belongings, but it has not all been added up yet. What kills me is that I loved tinkering with these and watching my son and his friends enjoy them. Although a freak accident, I may never be able to bring myself to charge one up indoors for fear of this happening again. It will be challenge to get past that. See the before and after pictures below. There is no real point to this posting except as an FYI. Don't know if anything would have prevented the fire, but it has made me take a second look at what I have going on in the garage. I may even build a shed to store and charge the powerwheels in because of this incident. He sure was fortunate no one was hurt! 1. Install a smoke detector as close and above the powerwheels charging area. 4. Only charge the batteries with an after market automatic charger (with shut off) and never leave even these plugged in when not needed. Anyone else have some safety suggestions? I have a suggestion, and that would be to charge the batteries in a metal box. I've toyed around with RC helicopters a little and alot of the guys use lithium batteries in them which can be VERY dangerous to charge. Alot of them also use some sort of metal box to charge them in. I'm sure there'd be something that could be converted in order to charge these bigger power wheels batteries in. Thanks for bringing this to our attention!... I'm definately going to re-evaluate my charging setup. Mods-> ordered video, and 3" wheel bands, Next 18 or 24V, lights/horn/radio, then finally, rubber wheels. I am not clear on what kind of charger he was using? If he was charging with an actual automotive charger I can see this happening, it puts out way too many amps for a small deep cycle battery. The charger I use is the cheap $25 one from wal-mart that is intended as a trickle charger for marine and motorcycle batteries. It has auto shutoff and only puts out a small amount of amps. If you look on the side of your scooter style batteries it will state the maximum charging amperage. I would still like to know for sure what type of charger he was using since I leave mine charging overnight all the time. Was this a motor car battery charger? Has anyone else had a battery explode. My understanding is that the SLA batteries are safe as long as they aren't overcharged or charged with a high amp rate. I recall seeing one of those pictures in regards to the power wheels and the rack he built for them. I believe he was using a regular car battery charger based on his statement in the original post. I went back and tried to find the thread on Ryan's site but couldn't. He was asked there about what type of charger it was but I don't recall him replying. I posted the pictures just to raise awareness of the potential danger of doing something wrong not to discourage modding. Reasonable precautions such as ALWAYS fusing your batteries and only charging them with low amp automatic trickle chargers is cheap insurance against potential disaster. See my project pages:Old Ryan Hull Site Blog*****NEW! 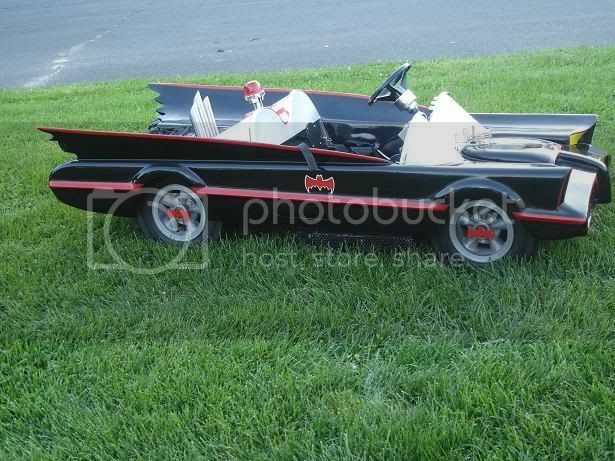 ***** Modified Power Wheels BLOG! I know this is old, but it is important because we have alot of new people on board. We all think of this as lighthearted fun, but we are dealing with potentially hazardous materials at times. Please, everyone think, SAFETY FIRST. This kind of thing is most of the reason I have stubbornly stuck to the PW batteries and chargers so far despite their higher costs. Maybe my paranoia isn't such a bad thing. "Just because you're paranoid, don't mean they're not after you". Just FYI but PW batteries can explode as easily as any other SLA battery, and the non-automatic charger also adds to the very real possibility of a fire / explosion. The stock PW chargers just keep pumping the current and voltage come hell or high water. IF left on for too long something like the above picture is a very real possibility. Sticking with stock PW chargers = Costing you more in said batteries since better chargers make for longer lasting (life) batteries. I own the quick chargers which I believe prevent overcharging. But if I do switch to the Schumacher unit you guys keep referencing, which specific model are you talking about? There are a number of different ones out there. The best ones we've found to use, are the Schumacher "battery companion" and the "model 600. The model 600 is really only needed if you're planning on charging in parallel. Oops, sorry, I assumed you were still using the "stock" non-automatic charger. This scared the crap out of me. I've decided to build myself an outdoor charging station. I was thinking about building a plywood box with some shelves in it, outlets etc. The one thing I don't know is how the cold will effect charging. Is it ok to store and charge batteries in cold tempatures? Also, does anyone have any suggestions for creating an outdoor charging station? ...Because Stock isn't good enough for my baby. I have thought about using a steel trash can to charge the batteries in. I figured that I could drill some vent holes near the top and attach a latch to keep the lid on in case of explosion. The idea I had was to use a small steel toolbox (I have a couple extra laying around). Drill some small holes in one end to put the wires through. If the battery or charger decide they wanna catch on fire, it'll be contained in a steel enclosure. Just make sure you add a couple of vents. No reason to be scared, just use common sense. You wouldn't catch me charging batteries in a "closed" container, unless it had a set of fans running in and out...we all know the batteries gas off, even if just a little every time you charge them-then, whats the point. I don't know if anyone here does it, but my charger for the gruber batteries is also fused-5 amp, it's a stock Battery Tender Plus. Do SLA batteries give off gas while charging? I was under the impression that they are "sealed"
PW Batteries are not sealed-they have vents in the top, under the plastic cover. Not all SLA's are created equal-some are FAA approved (Wheelchair applications)?? For some reason, I understood they all had some sort of saftey valve in the event of serious overcharging. Very nice of that guys neighbor to be out there with a hose trying to put it out though. This thread is about my house. I haven't visited any Power Wheels sites since posting that message but thought I would poke around tonight. I was using a Craftsman automotive charger @ 2A to charge my batteries. I had never experienced any problems. That day, a battery had been charging for about 2 hours while I tinkered around in the garage. I walked around the side of my house for about 10 minutes, eventually heard some strange crackling noises, and came back around the see my garage on fire. It was too late to try and put it out. The fire investigator contracted by my insurance company determined that the fire originated in the corner where my power wheels were stored and charger was in use. He could not definitively say what about the charging process was the cause: the battery, the charger, or the electrical outlet. He did dig up all of the wiring and determined that the wiring up to the electrical socket looked fine. The fire was on 5/26/06. Our house has been rebuilt and we moved back in on 12/07/06. I have acquired some more power wheels, but I now always charge the batteries in the middle of the garage floor with nothing else around. My thinking is that if something goes wrong again that at least I can minimize the opportunity for it to catch anything else on fire. I am now using a small charger that I purchased at Walmart, a Schumacher. After the fire, I heard countless stories from people who had charging batteries, TVs, garage door openers, fish tanks, refrigerators, etc spontaneously catch on fire. I've learned that you can't go around paranoid that electrical devices are going to start a fire or it will drive you crazy. It has taken a while for me to feel comfortable charging batteries, but I am OK now. The good news is, State Farm was great, no one was injured, and we have moved on. I was back up to 4 Power Wheels before this weekend when someone gave me a Gator to fix and keep. Thanks tomballpkr for sharing your experience with us. I'm glad that your house is rebuilt and that you have moved back in. Recently I have turned to charging with several 350 milliamp automatic chargers. They do take a while to charge, but I have a good supply of batteries now, so I always have some charged. The 350 ma chargers have auto shut off when the batteries are fully charged. The main reason why I changed to these chargers is that even the 1 amp automatic chargers (aftermarket) I had used to get extremely hot. The stock chargers (not automatic) used to get even hotter. I once had a 1.5 amp charger (not automatic) which I got with a jeep off ebay (new) that used to get even too hot to touch. The 350 ma only get slightly warm during charging, even when the weather is hot. Tomballpkr, that PW garage was cool. Are you going to build another one? The main reason why I changed to these chargers is that even the 1 amp automatic chargers (aftermarket) I had used to get extremely hot. I agree - my Schumacher Battery Companion used to get VERY hot. I punched a hole in the top of it and mounted a computer cooling fan. That is an interesting note about adding a fan to the batter charger. My Craftsman charger that bit the dust was one of those that would also do 75A to start your car. It did not have a fan in it. I've since purchased a new automotive charger at Sam's Club and it has a digital readout showing the amperage and as the amps increase so does the cooling fan in the side of it. Even at 2A it is running. I am wondering if my old charger just overheated and chose that day to catch on fire. That's the nice thing about the model 600, it has a built in fan. personally I never charge any battery at night or when i'm not going to watch it. I fly RC planes and use Lithium type batteries (Lipo) and these packs when changed with just a slight over voltage will explode into a huge flame and easily burn a house down. thank god they don't take 10 hours to charge though..these will finish in just 10-15 minutes. Just a little reminder to everyone and for those who are new and haven't seen this yet. Please be careful everyone. It's my Little Deuce Coupe...You don't know what I got. Batteries included, are you really concerned or are you just keen to break 1000.
i think he's truly concerned. he did the same thing earlier this year. just after christmas, guess he's a little more on the ball this time. and yes this is becoming a problem. wife has threatened divorce.-- she'll come around. Interesting thread. Wondered about that happening. Did some experimenting with low-voltage (bad) batteries. I hooked one in parallel with a car battery outside to try to restore it. What I got was a serious venting event noted on the battery. I don't plan on doing that again. I have put a Harbor Freight timer on my PW brick chargers so they could only go 12 hours, but I think I'm going to get rid of my "dumb chargers". I have a Gruber tricle charger that should be here 12/4, plus I'm going to get another Companion or Gruber after that. Should be able to sell off the bricks. I'm going to have to build that shed. That's funny, but no I am seriously concerned. Almost every time I hook up my chargers I think about that picture. Especially since one of my chargers is a thirteen dollar Harbor Freight special. Batteries/chargers can be dangerous, I'm so stupid, I put non-rechargeable AA batteries in our Rechargeable battery charger by accident last month. My husband came down and noticed the next day and the acid had leaked out and ruined the charger. Not sure if he was trying to scare me or what, but he said it could have caused a fire. i dont think he was trying to scare you, he was telling you the truth. if some kind of combustable material was close to the battery charger and leaking batteries, it could have started a fire. all you need for a fire is heat, oxygen, fuel and a chain reaction. it called the fire tetrahedron. not saying that a fire will happen everytime you did that, but rather the conditions do exist and it is probable that a fire might happen, so glad it didnt. just be carefull. Notice the neighbor spraying the house with a hose. Thats a loyal neighbor! Though futile, that was nice gesture. I wonder if the guy that had the fire bought fire hoses after that incident for the hydrant in front of his house. Hmm, could've been a bit O wishful self-defense as well, but nice all the same. It's amazing the before and after picture, really brings the PW loss home. That was a nice PW setup. I am the original poster. My collection has been built back up slowly due to a lot of mostly free vehicles that I have acquired one way or another. I now always charge batteries in the center of my garage on a small table so that if anything goes wrong there is little to catch on fire. I have installed 2 smoke detectors in my garage to detect if anything goes wrong again. Here are some photos of my current collection. It is way overboard so I need to sell some during this December leading up to Xmas. I never did rebuild the parking garage I had for the power wheels. I just have them all stuffed into my 2-car garage. Well if you are going to get rid of any of those whats the chances of selling the corvette? So you moved from the other house? Did you get it rebuilt, or perhaps you're still waiting? They rebuilt the house in the same location. Took about 7 months. We have been moved back in for 1 year as of this Friday 12/7. OK, I just bought the little Barbie VW 6 volt PW for my little girl for Christmas. I was planning on using the battery and charger that came along with it. I know little about charging battery powered things. I have no plans on any modifications (probably obvious by my choice in cars), just came across this site by accident. I realize I am not in the same league as any of you with my little pink go-cart! Now I am afraid to keep the vehicle after seeing this. Should I be? no, you should not be afraid of the new power wheels you just bought. this is a worst case scenario of what could happen and might if you are not carfull and have an equipment malfuntion. the chargers that come with a power wheels are not "smart chargers" or chargers with a voltage checking float feature. so there is a possibility, although slim, that this could happen. most of the time it just shortens battery life. to bring you up to speed on the ways of batteries and chargers here are a couple of links to read through and hopefully make you feel better. all of these links can be found in the FAQ section on the main forum page. glad to have you on the site and hope you stay and learn more. if you need any help, just holler. Thanks for the quick reply, gameboy. Also, I was excited about this being such a tiny little car and thinking she could ride it through the house on the cold winter days in MN (it didn't even hit 20 today). The manual states to only use outdoors, but is it really an issues with this little thing? Does the bottom get hot or what are the possible dangers?